The Beefeater BBQ range includes portable and mobile models as well as a large selection of Beefeater built-in BBQs. 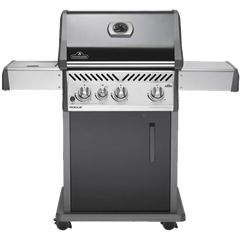 The Australian manufacturers know how to manufacture top quality grills, and this is backed up by lifetime warranties to give you total peace of mind. 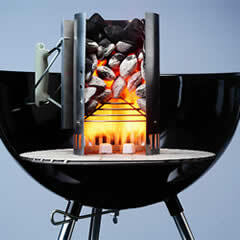 At BBQWorld we offer a great range of barbecues as well as Beefeater BBQ spares and Beefeater BBQ accessories. You can either buy online, call us for help, or call in at Dawson's Department Store to discuss all of your barbecue buying requirements and to ensure that you get the barbecue that suits your lifestyle. Beefeater portable barbecues are ideal if you travel a lot, go on regular camping or caravanning holidays, or even if you are stuck for space. They offer high quality barbecuing but they won't take up half the patio or the entire boot of your car. The Beefeater BUGG is one example of this portable but high quality outdoor cooking experience and with BBQWorld you can enjoy competitive prices on this and other models of Beefeater BBQ. Portable grills are extremely convenient. They provide greater cooking options than a camping stove, and through the use of accessories like new and additional griddles, you can create complex and enjoyable meals even while camping or on holiday. Mobile Beefeater barbecues are designed for use on the patio or in the garden. They are larger than the portable models but they can still be easily wheeled in and out of storage, they provide a great grilling experience, and you can also buy from a selection of accessories and parts to help further enhance your outdoor grilling experience. The Discovery 1000R series, for example, has three burners and a side burner. 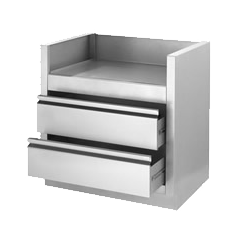 It has foldable side tables, and you can even upgrade to a four burner model if you need more cooking space. Accessories like a Beefeater BBQ cover allow you to protect your barbecue from the elements and ensure that you continue to enjoy the grilling experience. Beefeater are especially well known for the production and supply of durable, long lasting, and high quality built in BBQs. These models are more like an outdoor kitchen than their portable or mobile barbecues, which enables you to more easily prepare complex and full meals. You can create a completely bespoke outdoor kitchen, with up to 6 burners and cooking zones, and you can even incorporate built-in furniture and units. Enjoy the preparation and cooking space that you would normally only enjoy in your kitchen. To further enhance the cooking experience that you enjoy with a Beefeater built-in BBQ, choose from a large catalogue of built-in furniture. Add kitchen units, cupboards, and preparation areas to your outdoor dining space. If you have a covered area, then you really can turn your back garden into an outdoor living area. Add comfortable furniture, use parasols and windbreaks, and create a space where you will want to spend every hour. Beefeater also supplies built-in fridges, so that you can keep your food and drink chilled while you wait to prepare it. The Artisan Kitchen Series is a range of luxurious and high-grade built-in barbecue furniture that is designed for this very purpose. No matter how much care and maintenance you give to your barbecue, the fact is that barbecues and outdoor furniture are subjected to the elements and to rigorous use, on a regular basis. This means that your barbecue can endure physical damage, as well as environmental damage. Covers can protect against the rain, snow, and even against some frost, but corrosion can still become a problem. Parts may get knocked or damaged, and even regular use can cause damage to your outdoor kitchen or built-in barbecue range. The regular moving of a portable or mobile barbecue means that you could cause damage in this way too. 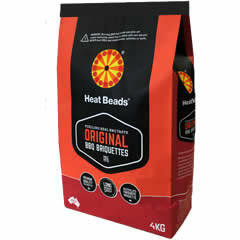 BBQWorld offers Beefeater BBQ spares to replace damaged or missing parts from your Beefeater model. Choose from a huge selection of Beefeater BBQ accessories; some of which are designed for use with the portable or mobile models and some of which are designed specifically to enhance the built-in models that Beefeater are so well-known for. 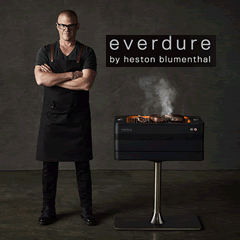 Accessories include items like meat probe thermometers so that you can master the art of outdoor cooking. As well as tongs and other typical barbecue accessories, you can also buy Beefeater carving sets and even a natural gas conversion kit to make your barbecue an even more convenient option. By combining the best barbecues with the right barbecue accessories, you can create the perfect outdoor cooking and dining experience. You can also buy a trim kit for models like the 1000R Series; a kit that includes condiment trays, side shelf handles, and can be easily fitted to your existing barbecue. Barbecues naturally have to endure difficult environmental conditions. Even during the summer, owners should expect rain storms, while the cold and frost during the winter, means that built-in barbecues and even mobile models have to endure difficult conditions. A Beefeater BBQ cover not only helps to protect against the rain and other weather conditions, it can prevent dirt and debris from getting into the burners. This makes the barbecue easier to clean and it means that you don't have to spend hours preparing your grill before you start using it again. BBQWorld is the official website of Dawson's Department Store. 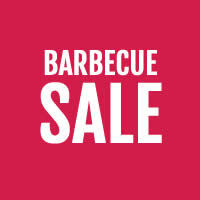 We stock barbecues and barbecue accessories from a host of well-known companies, including Weber as well as Beefeater. Buy all of your outdoor cooking and dining accessories and items at competitive prices, enjoy free delivery on orders over �50. Access replacement parts and other accessories that are designed to make your life easier and to improve your outdoor cooking experience backed up with great customer service. THE GRILL HAS BEEN DELIVERED AND ARRIVED VERY QUICKLY. I WAS IMPRESSED WITH THIS SERVICE.THE GRILL IS OF GOOD QUALITY AND FITS MY BBQ PERFECTLY. MANY THANKS.